Even though we would like to believe that SIP Trunking is becoming more prevalent, the current status (at least in New Zealand) is that many are still using ISDN to deliver PSTN connectivity. This means that when deploying a Lync Enterprise Voice Solution we will need to intercept the ISDN with a gateway\SBC (Session Border Controller). The SBC will then bridge the ISDN to a SIP Trunk configured to connect to Lync Mediation Server. OK, so lets get a bit more acquainted with ISDN. ISDN (Integrated Services Digital Network) is a system of digital phone connections that has been designed for sending voice, video, and data simultaneously over digital or ordinary phone lines. Generally we see 2 types of ISDN, Primary Rate and Basic Rate. Depending on who you talk to you will find a large range of terms used when speaking of ISDN Primary and Basic rates. Basic Rate is also referred to as BRI (Basic Rate Interface), BRA (Basic Rate Access), S0 Bus, ISDN 2 and 2B + D.
Primary Rate (E1) is often refereed to as PRI (Primary Rate Interface), PRA (Primary Rate Access), S2 Bus, ISDN 30 and 30 B + D.
Primary Rate comes in two sizes, E1 and T1. E1 is a 30 channel circuit where as T1 is a 23 channel circuit. ISDN speeds are set at transmission speeds up to 64 Kbps per channel. Primary Rate E1 is often referred to a a 2 Mb circuit. This is because 32 Channels at 64 Kbps is 2,048 Kbps (or 2 Mbps). Hang-on, didn’t we just say 30 channels for E1? 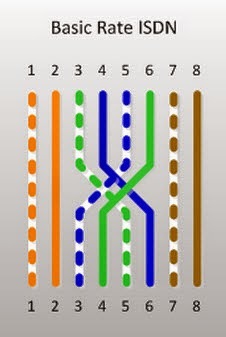 Correct, however there is also the signalling channel (usually channel no. 16) as well as a “channel” that control the synchronization. Thus 30 B (bearer) channels represent the capacity and the D (Data) represents the signalling and sync info for the circuit. Basic rate on the other hand has just 2 B channels at 64 Kbps and a single D channel for signalling and synchronization at 16 Kbps. In an enterprise voice environment each B channel can carry one voice conversation. ISDN runs at 8000 Hz, this means that every second the channels make 8000 round trips between Telco and ISDN terminating equipment. Because of this it is very important that a clocking system is in place to provide a reference point to make sure that the channels remain in phase. Telcos are generally the best sources of accurate clocks and will be much more accurate than any hardware that generates its own clock speed on site. 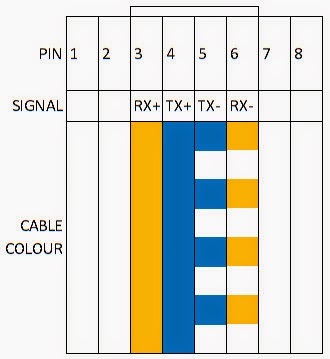 Both ISDN Primary Rate and Basic rate are 2 copper pair connections (4 physical wires). One pair is for Transmit (TX) and the other for receive (RX). Its BEST to ensure that the actual wires used for transmit form a pair, don’t split them as this can cause hard to diagnose issues. For Example Blue & Blue\White would make a suitable TX pair, while Orange and Orange\White makes a good RX pair. Also, each pair has a + (called “tip”) and a – (called “ring”). So the Rx pair has a RX+ and a RX- wire as does the TX pair. The pairs are not polarity sensitive. Looking at a RJ45 socket you will notice that Basic Rate and Primary Rate use different pin outs. The endpoint side of the ISDN circuit (Usually a PABX) is also referred to as the Terminal Endpoint (TE). The network side of the circuit (Usually the Telco) is also called Network Terminator (NT). When connecting a NT to a TE the cable needs to be cross over. 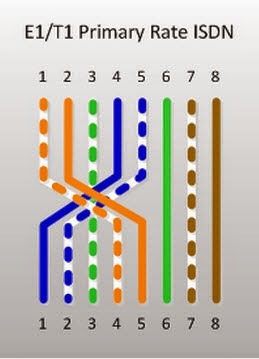 This has nothing to do with ethernet cross over..
Cross over simply means that the TX pair on the NT side is wired to the RX pair on the TE side and visa versa. Intercepting ISDN PRI to a PABX with a SBC will need a cross over cable from the SBC to the PABX. The image depicts cross over, a standard ether net cable may be used as a straight cable. 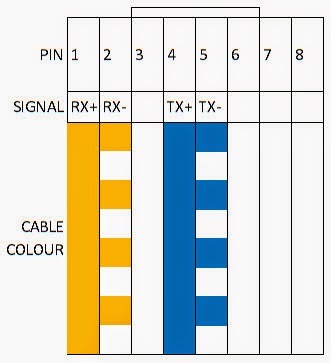 Although the images above indicate the wiring of all the pins, only the TX and RX pins are used. Very useful article. Thank you for posting this. Thank you Suresh, you are welcome.